This topic of cleaning concrete floors is interesting unto itself but even more interesting because of the different varieties of concrete. Specifically the goal of this article is to teach and explain about polished concrete floors. It will cover what is polished concrete, what is polish concrete, daily cleaning maintenance in a commercial environment and to dispel some myths about concrete and the no maintenance marketing of concrete floors in commercial accounts. Concrete is becoming a popular floor but polished concrete is even more popular in commercial building especially in retail stores. The cost of maintaining a retail floor with vinyl (VCT) tile and/or carpeting is huge and to achieve the appearance levels that shopper’s desire in selecting a store to spend their money is a big expense to retailers. The concrete industry decided to start and promote concrete as an alternative to retailers with the marketing points that concrete does not require any floor sealing, waxing, finishing, etc. The only maintenance was daily scrubbing. Some concrete contractors and installers even have gone as far as stating that the end-user does not even need a floor cleaner to clean the concrete floors. Retailers such as Cabelas, Bass Pro Shops, Wal-Mart, Menards, Lowes and Home Depot stores have been moving in this direction to save construction cost and maintenance of the facility. This overall cost savings has more retailers testing concrete for their stores’ floor but with more than 10 years of myths of no waxing or sealing of the concrete floors. These polished concrete floors in retail stores are showing wear, stains that cannot be removed and dusting. We will outline what the proper way to maintain polished concrete that will result in better looking floors, minimize maintenance expenses and most importantly protect the concrete floor from wear and permanent staining. In the event you are more interested in the actual cleaning procedures of concrete floors, please refer to the following link to that particular article (Cleaning Concrete Floors – Routine or Daily Cleaning – Commercial). Myth #1: No top coating with a seal for protection of the concrete is required making it Maintenance Free.Top coatings not only beautifies the floor with a gloss but it’s primary reason for using a top coating on a floor is to protect the floor from damage and prevent soils from entering deep into the pores of the floor. Once a floors pore is deeply soiled and/or stained, the cleaning is for far more difficult and in some instances, especially with concrete, cleaning can be impossible to remove all the soils and stains. Myth #2: You only need plain water to clean concrete floors.Plain water does not clean as well as using a cleaning product. We could go into a long explanation of why you need a cleaner to clean the concrete floor but for time sake we will not. Ask yourself this question, would use clean your clothes with plain water or use a laundry detergent. If you answer is yes you would use a laundry detergent. The same principle applies to cleaning concrete floors. Chemical polishing requires to be re-applied from time to time and does not offer as good of shine and hardening of the concrete floor as mechanical polishing. Cleaning Concrete Floor – Polished Concrete – What is it? Is a process that improves the appearance of the concrete floor through polishing the concrete to a glossy shine and a side benefit it also toughens the concrete floor by making it harder. Cleaning Concrete Floor – How it is Polished? This process requires the use of diamond grit pads, a chemical Densifier applied to the concrete floor. A series of grinding steps are used to polish the concrete floors to the desired gloss levels. As many as up to ten different grinding steps using special pads starting with courser grit and slowly working up to finer grit pads that polish the concrete floor surface. A chemical Densifier is applied to the surface of the concrete. This process requires multiple polishing steps to gain the desired gloss levels to the concrete floor. Cleaning Concrete Floor – What is a Densifier? Hire a professional service to polish your concrete floors. This is a must. There are too many procedural steps to achieve positive results and any errors are too costly. Leave it to a professional. No or Poor daily cleaning and/or high-speed burnishing will result in dark appearing floors and lower gloss levels. Use a concrete floor cleaner for daily scrubbing or mopping. Use a concrete water based floor finish or seal with minimum coats (3 Coats) to provide protection against staining and damage from foot traffic and spills. This will minimize the cost of maintenance and provide a longer lasting concrete floor, eliminate dusting and stains and most importantly will extend the highly expensive cycles between major re-polishing (grinding) of the floors to bring them back to the desired level of appearance. Clean spills as soon as possible to reduce permanent staining of the concrete. Try to protect areas of the floor that are subject to acid spills. Acid spills will etch the concrete floor immediately and permanently damage the floor. The only way to correct etching would be to grind the concrete floor again. This is cost prohibited and time coming. 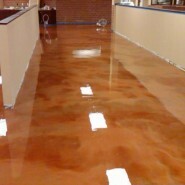 D&B Industrial Floor Coatings, Inc.